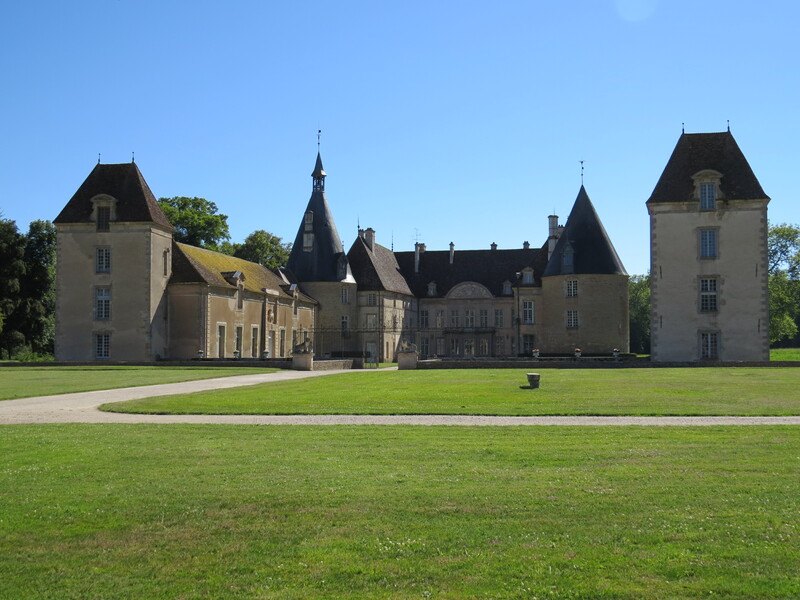 …is a castle in the field of the community Commarin in the department Côte-d’Or in the Burgundy region. The roots of the current castle are in a fortified house from the 12th century. Its present appearance it got through modernizations in the 17th and 18th century. Unlike many other French palace buildings, it survived both the French Revolution and the two world wars. The building and the park are listed since 1949. The town is located approximately 38 kilometers west of Dijon and about 5 kilometers north of Châteauneuf-en-Auxois. The palace complex consists of a main building and atrium, which is located on a castle island surrounded by a moat. A two kilometer long avenue leads from the north-eastern side to the castle entrance which is marked by a wrought-iron gate. Two round towers with conical roofs remind of the medieval war times. The park with wide lawns and line trees, the barred gates and lounges with precious tapestries and furniture, take us back to the days of the monarchy. The facility is privately owned but can be visited on a guided tour during Easter and All Hallow’s Day. In 2003 also the castle park is open to visitors. The palace is part of the route Ducs de Bourgogne. You should keep your ticket, because you will get discounted entry in other places of the castle route (see also Castle Bussy-Rabutin).